We know when ground water table reached to surface the soil is said to be saturated up to ground surface. When water table remains at a depth Z1 the soil above the water table is not saturated and below this depth soil is fully saturated i.e. saturation is 100%. Ground water table may be lowered due to seasonal change or by many man made actions. After reaching a new depth Z2,(Z2>Z1), it is expected to become degree of saturation is zero above Z2. But actual situation is not the same; this is due to presence of capillary forces within pores. Let’s start with specific yield; this is the ratio of retained volume of water from a given element of soil to total volume of water. The drainage of water must be under gravity. This term is also known as phreatic storage co-efficient. Typical values of specific yield for coarse sand & gravels lie between 0.2~0.3. 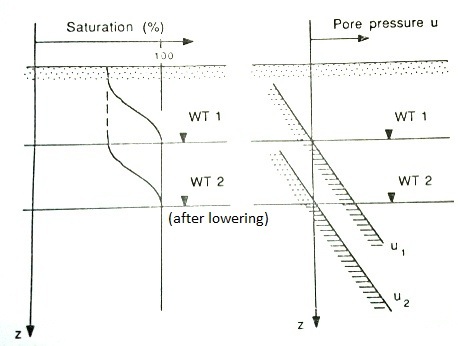 Following figure illustrates variation in saturation of soil mass after lowering water table from depth Z2 to Z1. Specific retention is the remaining water in the soil mass after discharge of specific yield; in other word water retained in soil mass after specific yield is specific retention.We know soil is porous medium; thus sum of specific retention and specific yield must comprise porosity of soil mass. or, Specific retention = Porosity – Specific yield. We know, when pore water pressure is decreased under change in water table, the effective stress is increased which produce compression on soil skeleton. Thus some water from soil mass is released which was fully saturated initially; this process is called consolidation in soil mechanics. Water released as volume from each unit volume of the aquifer soil for each unit change in water pressure (head) is known as specific storage. In ground water hydrology, it is also known as specific mass storativity. When specific storage is multiplied by thickness of water bearing layer, it yields storage co-efficient of the aquifer.